The account of Jesus washing the feet of His apostles in the Gospel of Saint John (13:1-11) describes this emotional scene at the Last Supper on that world-changing Holy Thursday. For the Master Himself to perform a service normally relegated to a slave or servant was an action both humble and humbling. We recall Peter’s blustering refusal to have his feet washed by Jesus, and his eventual acquiescence at Jesus’ insistence. But what were the reactions of the other eleven? A film viewed some years ago depicted this scene most movingly. As Jesus made His way around the table, washing the feet of each apostle in turn, some appeared confused, some afraid, some moved to tears. Then, when Jesus approached Judas, the scene became truly electric; the look that passed between the two was charged with such powerful emotion on both sides. That scene brought home the impact such a wordless exchange must have had on them both at Jesus’ unexpected action. For meditation: What did Judas feel when Jesus’ eyes locked with his, knowing the treacherous action he was about to take? What was Jesus attempting to convey in His eyes, given His foreknowledge of that betrayal so soon to come? How can I comfort Jesus when reflecting on this scene today? 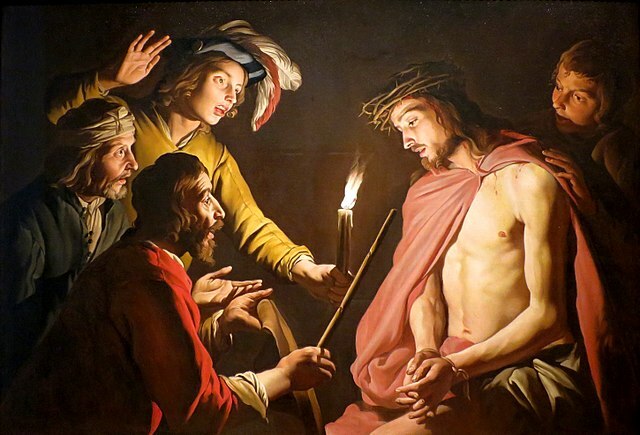 The triple denial of Jesus by the man He had chosen to lead His church must have caused terrible hurt and cruel disappointment to Jesus’ human heart. For Peter’s part, how mightily must he have wished those words of denial back inside his own fear-ridden heart. For meditation: What emotions were locked inside the look shared by Jesus and Peter on that night of fear, betrayal, abandonment, and denial? When Peter recalled that gaze through years of tearful reflection, what feelings were stirred within him? How can I comfort Jesus for this action of Peter? For meditation: What passed between Jesus and Pilate as they gazed into each other’s eyes? Did Pilate ever discover the nature of that eternal truth? How can I comfort Jesus, forced as He was to subordinate His rightful Kingly authority to that of one of His own creatures? The Stations of the Cross allow us to enter into the spirit of Jesus’ last hours on earth. Tradition tells us that Mary followed Him on the sorrowful journey to Calvary, and the Gospel of Saint John places her at the foot of Jesus’ cross at journey’s end (19:25-27). Accompanying her Son during that excruciatingly painful time made Our Lady a grief-stricken participant in His final agony and humiliation. For meditation: What did the “arrows” that traveled between the hearts of Jesus and Mary convey? How can I comfort both Jesus and Mary as I walk beside them along the Via Dolorosa, all the way to Calvary, during this Holy Week? When we meditate on these scenes from Jesus’ final hours, it is good to remind ourselves that the Scriptural events we contemplate are not simply stories written down long ago. Real flesh-and-blood people lived these events. In our reflection, we recall the significant looks that passed between them – looks replete with a power transcending words. For these real human beings playing roles in salvation history, that power – the power of a meaningful glance – cannot be overestimated.